Located midway between Valletta and Mdina, Villa Bologna – in the pretty village of Attard – is a great rest-stop on your tour to other parts of the island. Prices for private guided tours or group tours available on request. Arriva bus numbers 54 and 106 stop at the start of our road, just a few minutes’ walk from the Villa. 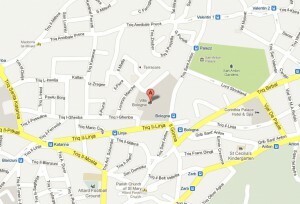 Alternatively, the X3 between Bugibba and the Airport stops in front of San Anton Gardens, a five-minute walk away. The Malta Sightseeing Hop-On Hop-Off bus tours also stop very nearby. To book, visit www.maltasightseeing.com and click on the ‘North/Blue Tour’. If you are journeying to Villa Bologna by car, first follow the signs to Attard and San Anton. 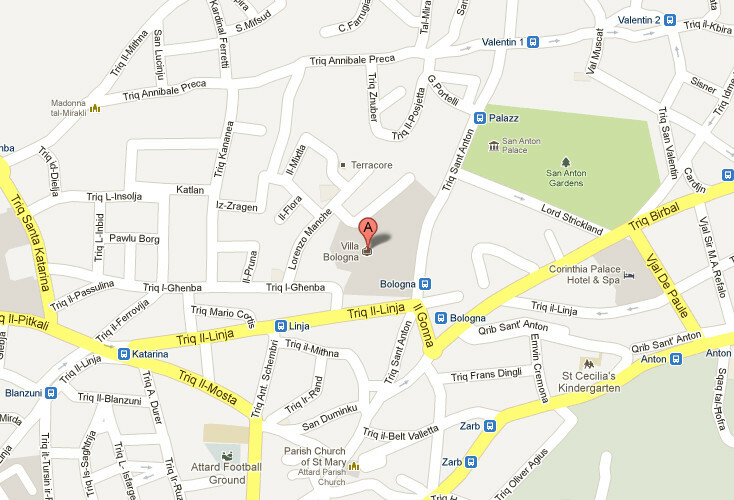 Then drive along Triq Birbal and onto Triq Sant Anton, and you’ll spot Villa Bologna. On-street parking is usually available just outside. Click the map to open Google Maps in a new window or tab.